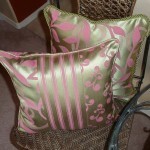 Pillows are a great way to spruce up your home. 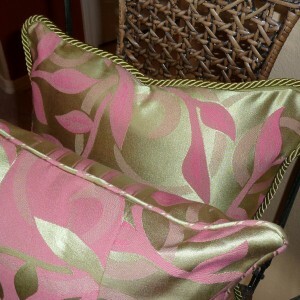 They add a warm, inviting touch and a comforting place to rest. But, boy, can they be expensive to buy. 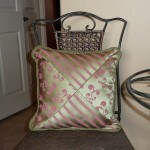 As sewers, we are lucky enough to make our own decor items, and we can make them just how we want them. 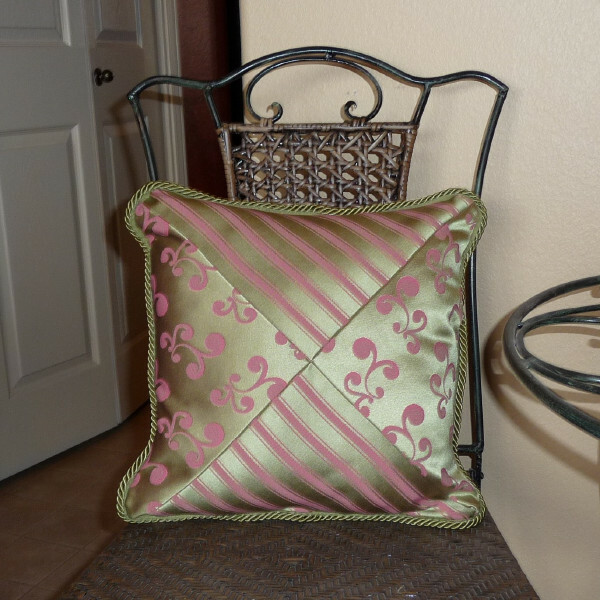 Pillows can be incredibly basic, or they can use pieced fabric design and fancy trims. This tutorial discusses adding rope lip cord and piping as trims to your pillows. I used a half-yard of the two floral fabrics and three-quarters of a yard of the striped, with some left over. 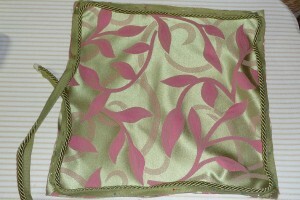 I used 2-1/8 yards of the lip cord and 2-1/4 yards of the piping. I may do things the hard way, I don’t know. 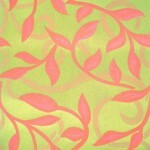 But I created a 17″x17″ square on paper. 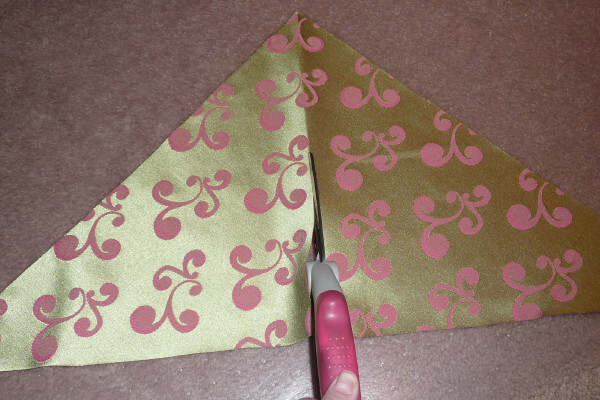 Then I cut it diagonally to form a triangle. Use this triangle to cut one piece of one of your fabrics. 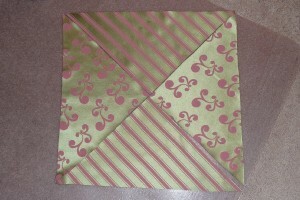 Then, fold it in half and finger-crease and cut along the crease to create two squares. 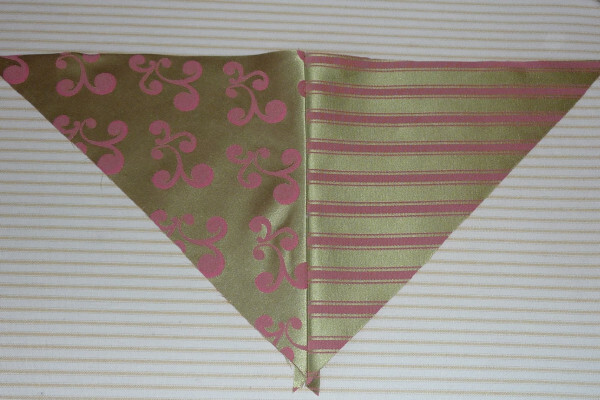 NOTE: For the striped fabric, I needed to cut each small triangle separately in order to have the stripes run the same way, so for that one, I just cut the paper triangle and cut two separate pieces of fabric with the stripe lined up how I wanted them. 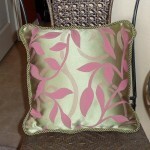 For this pillow, I cut three different fabrics into 6″x15″ rectangles for the front. 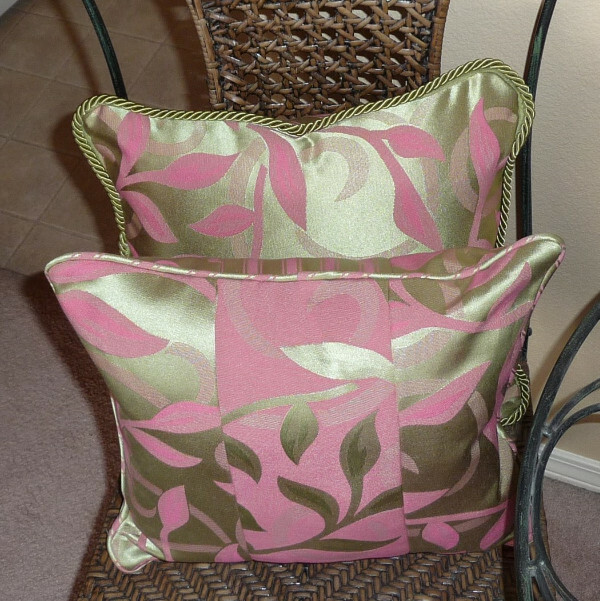 For the back, I cut three of the same fabric into three 6″x15″ pieces, and used the middle one with wrong side out, since these fabrics are so pretty on either side. 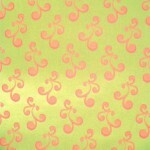 Please see the piping tutorial here for how to make the piping. 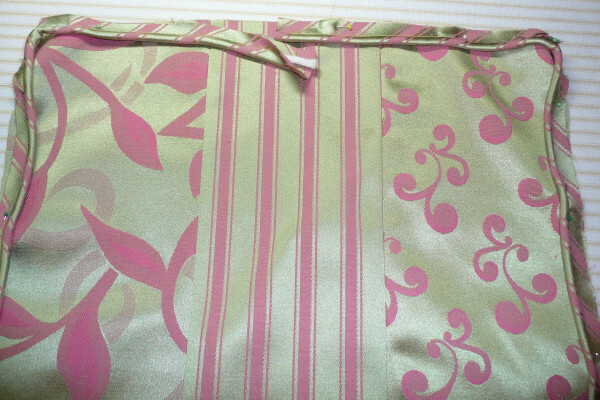 Basically, cut 1-1/2″ bias cut pieces (I prefer to use a rotary cutter and quilting ruler) and sew into a long strip. Fold strip, wrong-sides together, around the piping and sew close to the piping with a piping or zipper foot. Sew two small triangles of different fabrics together, re-forming the big triangle we started with. 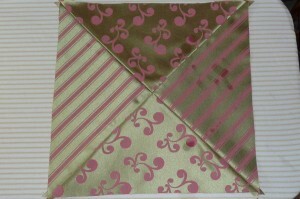 Then do the same thing with the other two pieces. 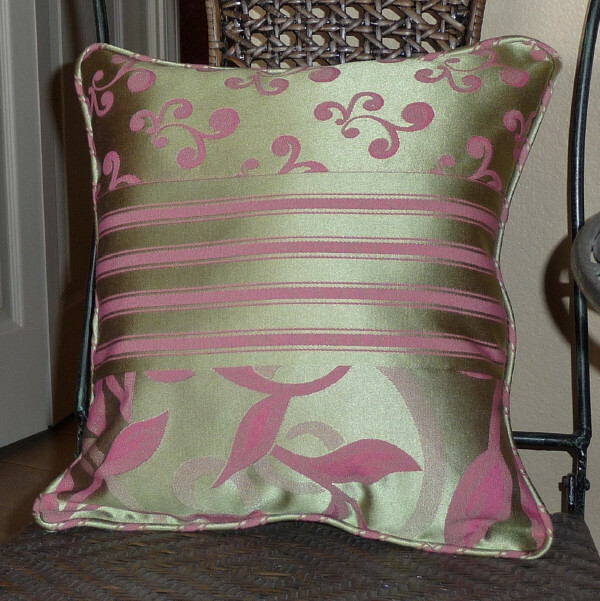 Use a half-inch seam allowance throughout this tutorial. 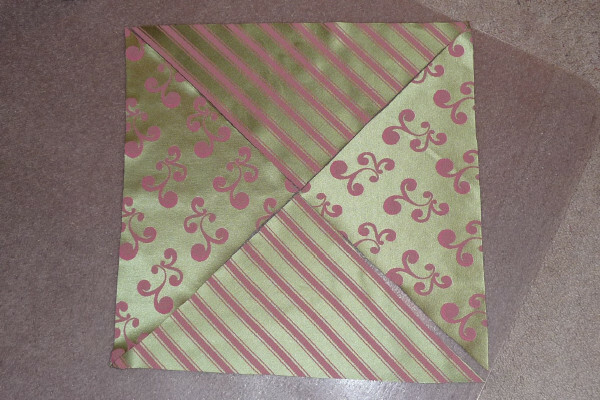 Place your new “big” triangles right-side together and pin, using great care to line up the seams. This will ensure you have a nice center point in the end. 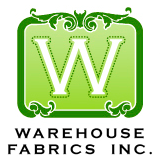 Press all of your seams open. 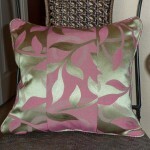 This fabric is part synthetic, so I needed a lower heat setting. 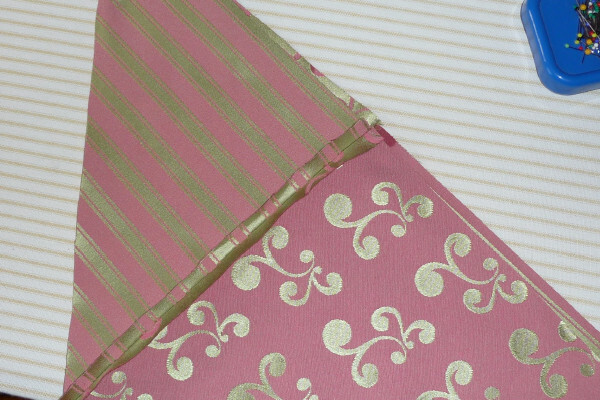 The spots on the right are just water from the iron. See how my center point lines up nicely? 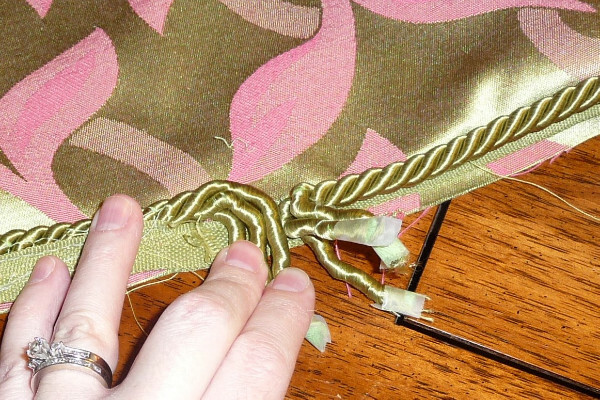 That requires careful pinning and sewing, as noted above. Here, I’ve taken the back of the pillow and started pinning the rope lip cord around it. On the corners, I clipped just a wee bit into the lip of the cord to help it turn. 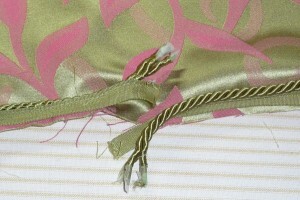 The fabric of this cord frays easily, I soon discovered, so I applied some Fray-Check. 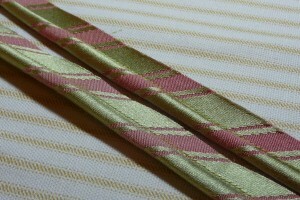 I have left the two ends loose. 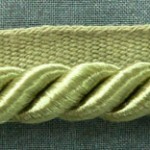 We’re going to perform some tricks to make a nice, blended cord where they meet. Now it’s time for some honesty. You see, sometimes I look for sewing help on the Internet, and you find places that go through steps, but don’t address the really tricky things. And then you feel like a failure because you’re struggling. That’s sort of what happened to me on this project. I found as I tried to sew the lip cord onto the back of the pillow that I was going to have a hard time finding a presser foot that let me get close to the cord but didn’t bump into it. I finally settled on my invisible-zipper foot. 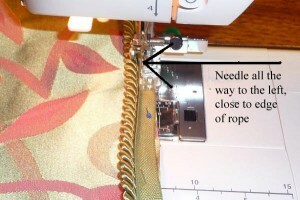 It’s not the zipper foot that’s invisible. 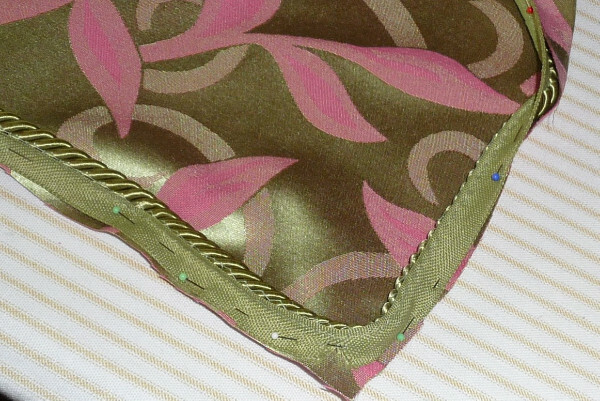 It’s for invisible zippers. It has a slidy thing on back that allows you to position the foot so the needle can go on the left side of the foot, right side or in a hole in the center. I have it so the needle is on the left side. I have my zipper foot all the way against the rope cord. I found that the more I tried to push into the cord and get it close, the more the whole entire thing pushed away from the edge of my fabric. 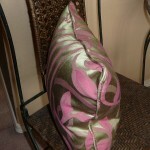 If I relaxed, it sewed much more easily and in the right place. Start stitching a few inches from the end, leaving a little bit loose. 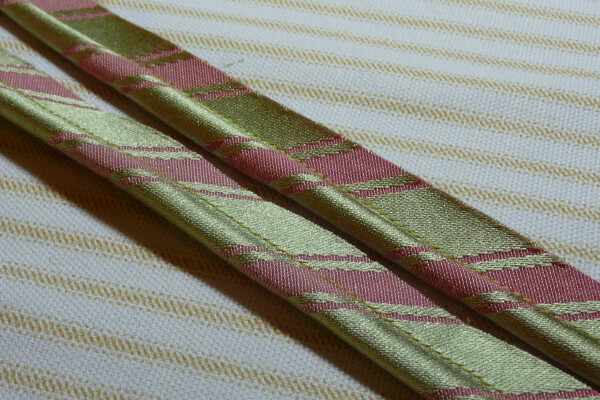 Still, when all was said and done, I didn’t have the stitching as close to the cord as I would have liked. I tried researching the subject and found no help. 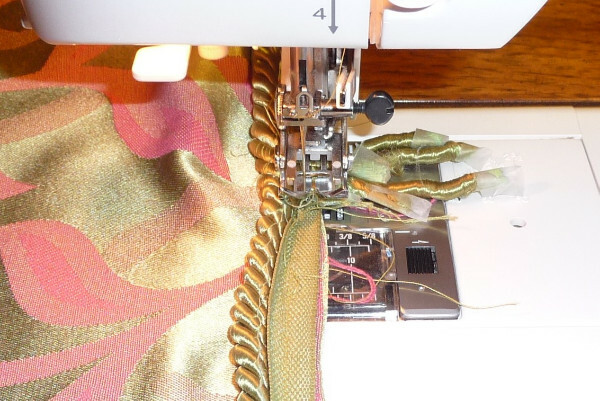 I’m not sure if an industrial sewing machine would have some easier way of doing this, or maybe it would be easier to do by hand. 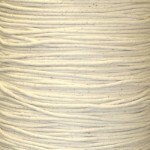 These are my honest observations, and I’d welcome any input on stitching even closer to the rope. OK, so I went all the way around, but I stopped a little bit shy of the other end. 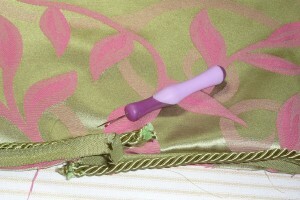 I take my seam ripper and remove a few of the stitches that hold the lip to the cord. Now, unwrap the cord from itself. I highly recommend putting a bit of tape on each individual end. It frays really quickly. Sew the tape together, overlapping, to the pillow back, holding the cord pieces out of the way. Here’s where things get a little weird, but it comes out pretty nifty. Flatten out your rope pieces on the left as shown. Now bring the right-hand rope pieces over, and try to twist them in such a manner that the rope looks continuous. This will take a little playing around, which is why it was a good idea to tape the ends so they won’t fray to nothing by the time you’re done. Held from another angle, you can see the basic idea. 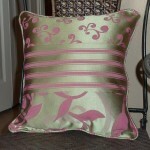 It just needs a bit of smoothing. And yet another view. Now we need to secure them. And this is where I really got stumped. 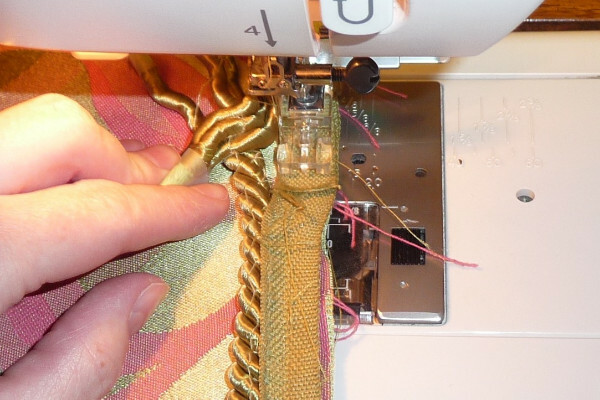 Without a jig of some sort, I couldn’t figure out how my home sewing machine was going to hop up over all this rope to sew it down. 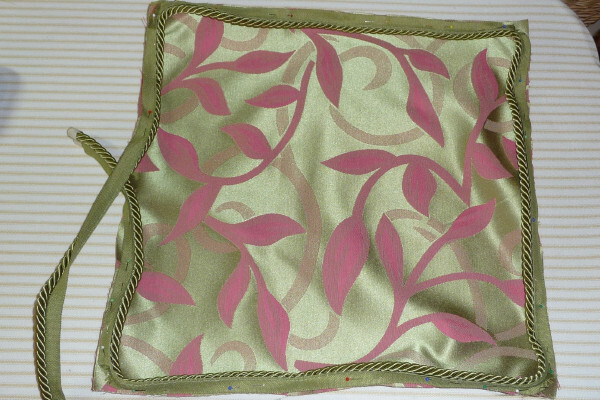 I attached my walking foot and that seemed to do the trick, though I really want one of those Jean-a-Ma-Jig things now. 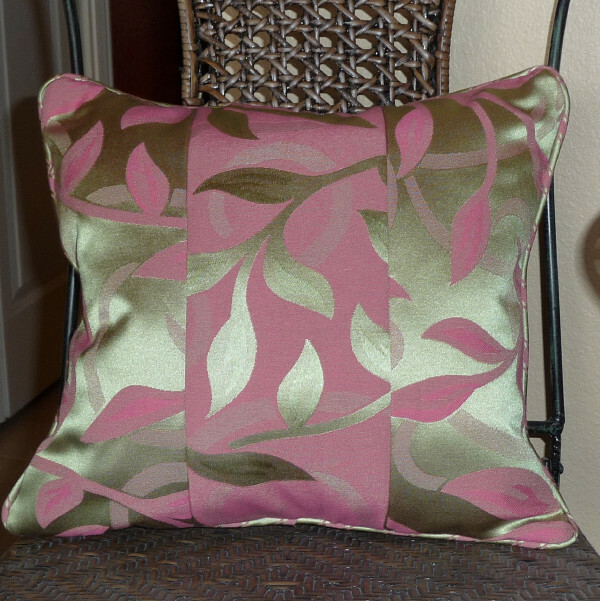 After this, I laid my pillow front (with the triangles) face-down and pinned the edges together. 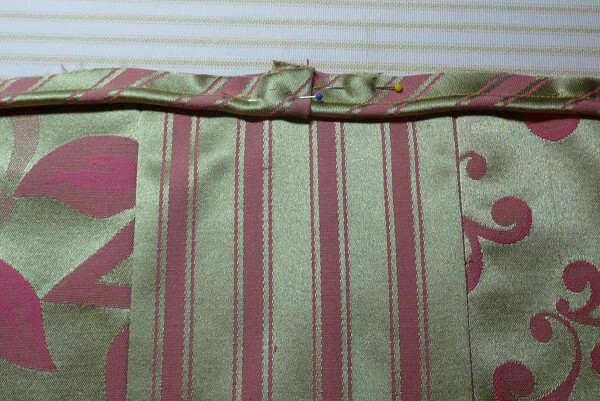 I sewed around with the invisible zipper foot again, starting just below this ropey mess to the left. 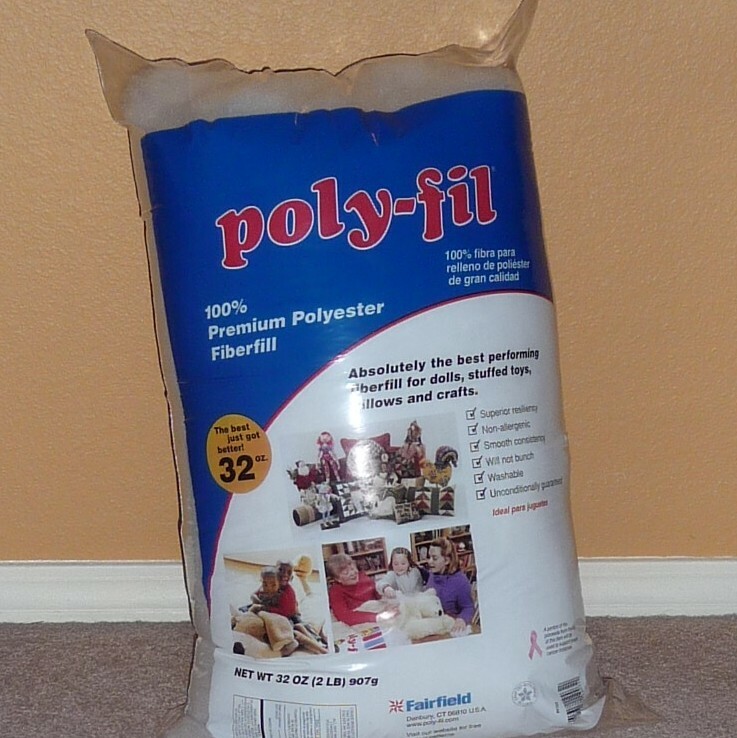 On one side, I left a hole big enough to fit my hand with a fistful of stuffing. When I got back to just above the rope ends, I switched back to the walking foot to finish up. Clip corners, turn and stuff. Hand sew the opening closed. This pillow has piping trim, and it’s much, much easier to do. 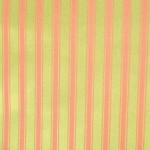 First, make piping using these instructions. 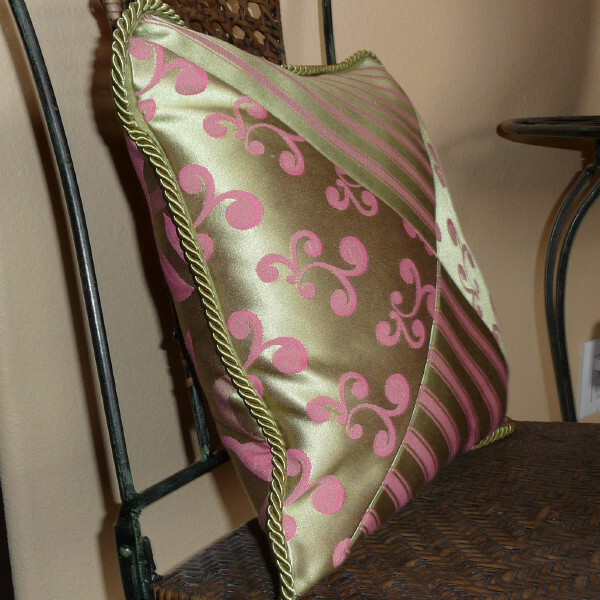 For the pillow front, I sewed together three strips. then I pinned the piping all the way around, leaving loose ends for the last few inches. 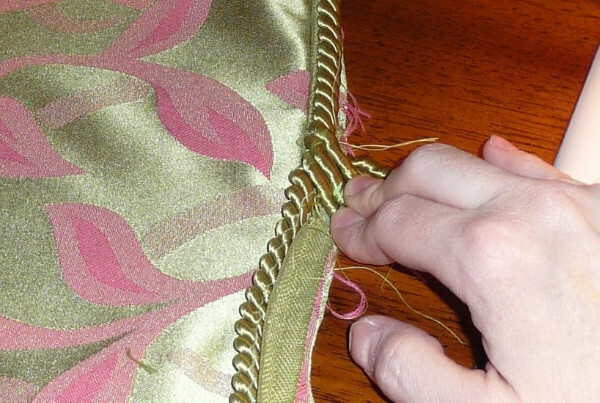 Now use your seam ripper to remove a stitches on your piping for an inch or so. Clip some of the piping out. 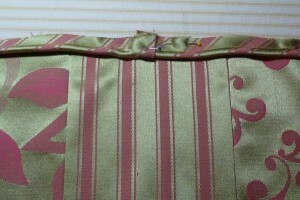 Trim the other end of the piping and cover so that it butts up against the clipped piping from the other side. 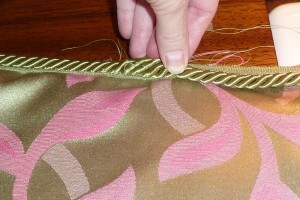 Fold over and press the end of the piping cover on the side where you clipped the piping. Insert one side into the other, as seen in the next photo. 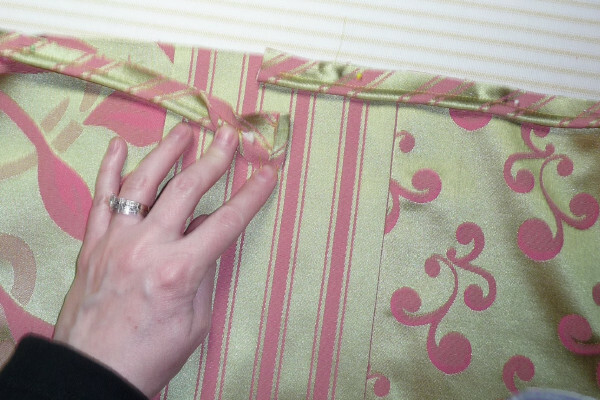 The piping on the right is inserted into the piping on the left, where we opened it up and clipped out a bit of the cotton piping inside to make room. 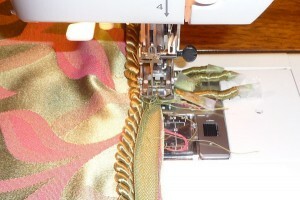 Sew in place using a piping foot or a zipper foot. 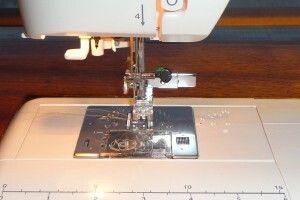 Once I paid $7 for a piping foot, I couldn’t believe I ever struggled any other way. It works like magic. For the other side of the pillow, I used three pieces of the same fabric, but I flipped one over to the wrong side. 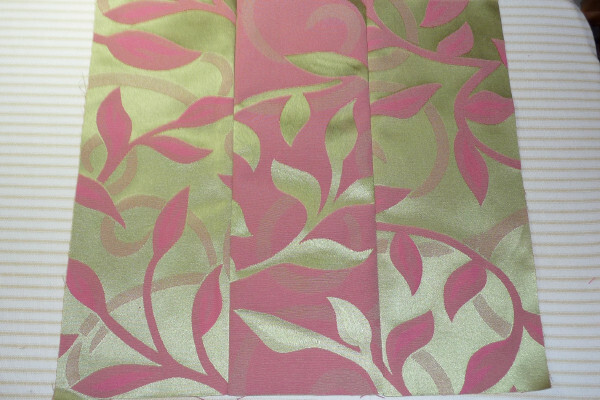 I wanted to showcase how pretty these reversible fabrics are. Now, as with the other pillow, place right sides together and pin. 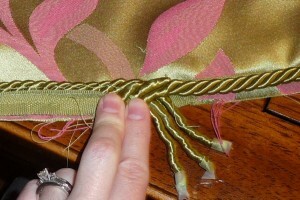 Sew all the way around using your piping foot, leaving a small hole big enough to fit your hand to stuff it. 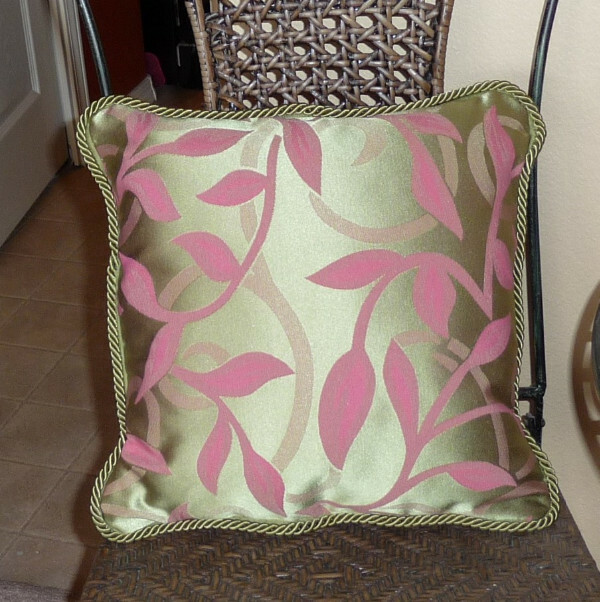 Let’s Make a Throw Pillow with designer cord!